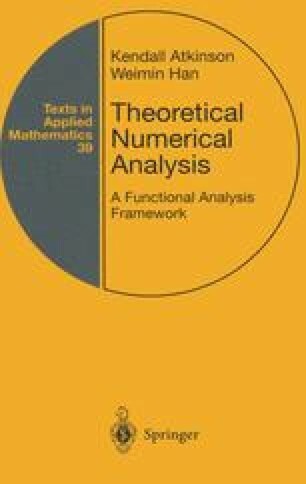 Many of the basic problems of applied mathematics share the property of linearity, and linear spaces and linear operators provide a general and useful framework for the analysis of such problems. More complicated applications often involve nonlinear operators, and a study of linear operators also offers some useful tools for the analysis of nonlinear operators. In this chapter we review some basic results on linear operators, and we give some illustrative applications to obtain results in numerical analysis. Some of the results are quoted without proof; and usually the reader can find detailed proofs of the results in a standard textbook on functional analysis (e.g., see Conway , Kantorovich and Akilov , and Zeidler [174, 175]).